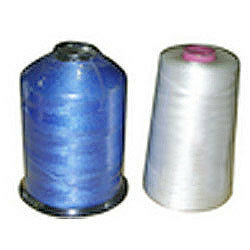 Providing you the best range of tarpaulin threads with effective & timely delivery. We offer Tarpaulin Threads to our clients in multiple colors and size specifications. Our extensive range finds application in Tarpaulin stitching, Gun carriage Covers and Truck Covers. We offer our complete assortment in customized specifications to satisfy the clients. Our range of industrial threads is appreciated for the features like high tensile strength, durable finish standard, Pucker free operation and competitive prices. The product is offered by us in polyester cotton blends and combed cotton variants. We develop Tarpaulin threads using the special lubricants to protect fabric coating from damage.